Being Catholic - What does it take? What does it take to be Catholic? Basically, we believe the Ten Commandments and the Apostle's Creed; then we pray to persevere. 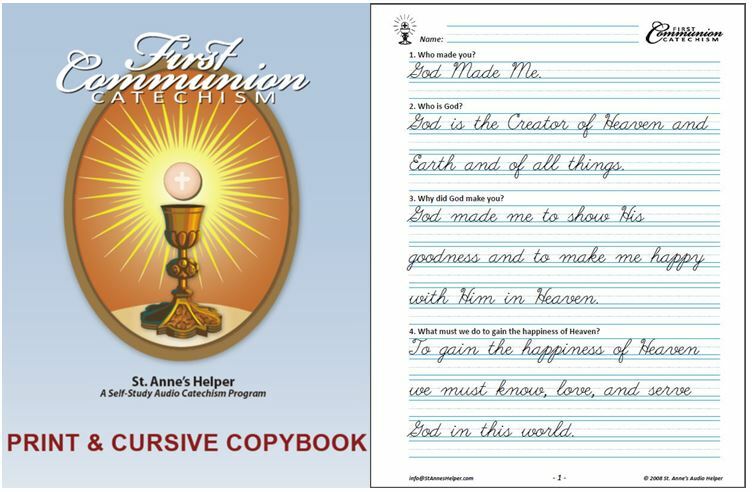 A catechism table of contents covers these plus the prayers and the sacraments; Baptism, First Communion, Confirmation. 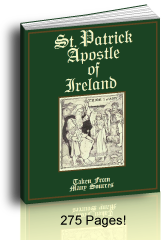 Other Roman Catholic books with stories about the lives of the saints make the catechism come to life, especially the biographies and writings of the great saints. Get a good Bible, too. We recommend the Douay-Rheims Bible since it has the surest and longest history. Truly, it is that simple! Did you know that there is one thing necessary? You must save your soul. Somehow you must get to Heaven. This is the Pearl of Great Price. You must find Eternal Happiness or you will suffer Eternal Sorrow and Anger. No one but you can do this. How? Then peruse our site that recommends the best sources with the best answers to this very question. Use the Search bar and the left nav bars. All of the truths of the Faith fall under the Ten Commandments. Easy. One through Ten. I-III The Sacraments, Apostles' Creed, the Rosary, and other Catholic prayers are covered by the first three Commandments. IV Marriage, education, family? Fourth Commandment. Abortion, euthanasia, war? V Fifth Commandment. Forms of immorality? VI & IX Sixth and Ninth Commandments. VII & X Theft of any sort, Communism, Socialism and other distributive -isms? Seventh and Tenth Commandments. VIII Lies, freedom of speech? Eighth Commandment. Easy. Hmm. Have you learned the Ten Commandments? It is easy to learn the basic Catholic beliefs. First, learn the Ten Commandments. Then learn the Apostle's Creed. The rest follows as you ask more or learn more about each of the Ten Commandments and the Twelve Articles of the Creed. These next books are my favorite beginner books. 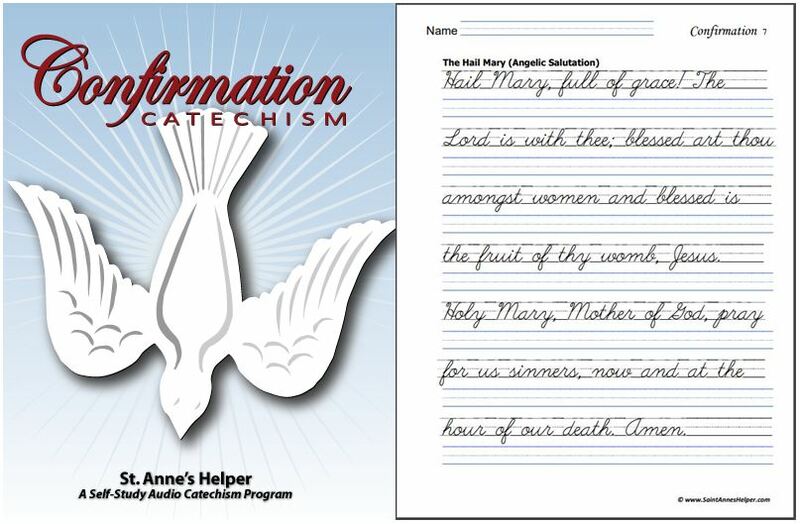 If you are working with children, use the Baltimore Catechism. That will cover plenty more than what is needed for First Communion and much of Confirmation. If you are an adult, you only need to read one catechism as there are no levels. 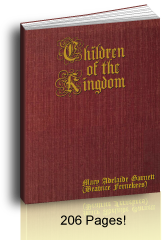 I have thoroughly enjoyed using the Catechism of the Council of Trent, and have used it with our high school children. I use the Catechism Explained as a reference book as it is fairly well indexed for an older book. 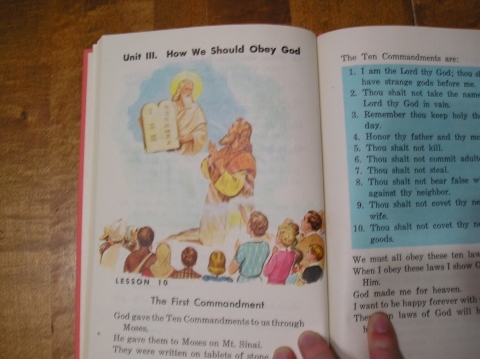 Ten Commandments both tell us what to do and what not to do; the "tells" and the "forbids" and they can be found in the First Communion catechism. The Apostles' Creed tells us what we believe in religion. "I believe in God the Father Almighty, Creator of Heaven and Earth...."
The Sacraments are the means by which we receive grace. The sacrament of Baptismis the first sacrament and it washes away Original Sin, makes us children of God and heirs of Heaven. The sacrament of the Holy Eucharist feeds us with the grace necessary to keep the Faith. The sacrament of Penance washes away our sins in the Blood of Jesus Christ. The sacrament of Confirmation makes us strong in the practice of the Faith. The sacrament of Matrimony gives each of us the grace necessary to persevere as a good spouse. For those who choose the better part, as St. Paul says, the sacrament of Holy Orders and the religious vows grant us those servants who will teach the Catholic Religion and will rule Jesus' Church. The sacrament of Extreme Unction grants us the strength necessary to die well, a most helpful grace! Count on the seven sacraments. All through life, Catholics have the help of grace of the sacraments. The grace of the sacraments is effective! Because of them you have the right before God to the help they confer. Once you are a member of the Church, you have the help necessary to persevere. The Rosary is our safest haven. It is a highly indulgenced prayer, second only to the Mass. Indulgenced means that there are promises as with the Ten Commandments. The Fourth Commandment is the first one with a promise. If we honor our parents we will have a long life, etc. The prayers of the Church and our own personal prayers communicate our thoughts to God and the prayers of the Church teach us as well! "Lex orandi, lex credendi." The law of prayer guides the law of faith and preserves it. The more devoutly you pray the easier it is to get to Heaven. Pray as you work and play by lifting your mind to God. The Bible tells us Creation's history through the first century. There are many rewrites, but the Catholic Bible has the whole Word of God in the most beautiful language. See it at this next link to get an idea of the beauty of your favorite Bible passages and to use as a Bible online to use for research and cut/paste options. The saints walked the walk and talked the talk! They are our examples to follow in the Roman Catholic Church; from heroic child martyrs as in The Children Of The Kingdom to greats like Saint Patrick. The prayers, Bible stories, stories of the saints, the corporal works of mercy, and the spiritual works of mercy of the make final perseverance easy! Fill your day with the service of God and He will fill you with Eternal Happiness! Aiming to live what the Church teaches is what makes Catholics happy, and we want the same for you and yours! Remember that the Faith is simple enough for the newborn to be Baptized and go to Heaven; and it is also more complex and full than even the great St. Thomas Aquinas could fathom! Welcome to St. Anne's Helper and our favorite introductions to the Church and remember with grateful tears that Jesus Christ died to save your soul and would have come for you even if you were the only one who had fallen. He saw you in His Agony and from His Most Holy Cross! He deserves our love and He deserves to make the rules for the creatures He created for the happiness of Heaven. The faithful follow Him to Heaven the Way that He calls us all, by following the Apostles' Creed and practicing the Ten Commandments! 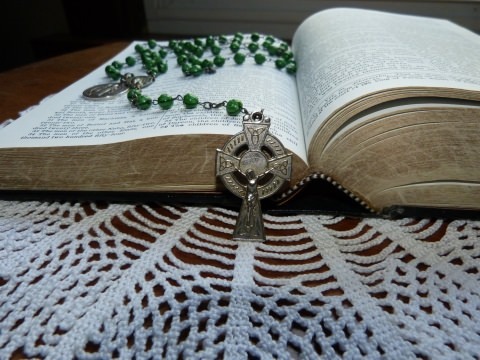 Learn the Rosary with a Video. Praying the Rosary creates our safest haven. Mary, Mediatrix of All Graces, promises that those who have a devotion to her Rosary will go to Heaven. Our own devotion while praying the daily Rosary is the main limitation. After the Most Holy Sacrifice of the Mass - the Rosary is the most indulgenced help! If you have children, you might enjoy our Rosary coloring pages. The conversion and Baptism stories that our visitors send to us are the thrill of our day! 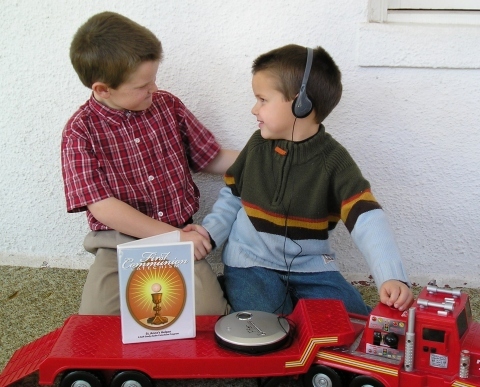 We dearly love to hear of the First Communion and Confirmation stories, too. Why? Because we know that these brothers and sisters in the Faith will have a great chance of attaining eternal happiness and because they are dear to the Sacred Hearts of Jesus and Mary! It is like hearing that Mom and Dad are happy at a sibling's happiness. This is the joy of being in the Communion of Saints. May God grant that you and your family live long and holy lives!